Use a browser other than Chrome or Edge to open the executable files. This software will operate on both PC and Mac, if Silverlight is installed on your computer. In order for CO2calc software to operate correctly, it must be installed directly onto your computer. Although it will not run on the internet, you will be notified if updates in the software are available. The latest version of the Silverlight software can now be downloaded. 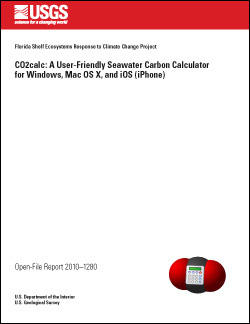 Robbins, L.L., Hansen, M.E., Kleypas, J.A., and Meylan, S.C., 2010, CO2calc—A user-friendly seawater carbon calculator for Windows, Max OS X, and iOS (iPhone): U.S. Geological Survey Open-File Report 2010–1280, 17 p.